University President Michael Drake sent students an email Friday outlining Ohio State’s new mental health task force, namely its purpose in determining what university services are doing well and what services can improve. Drake included in his message that in the past two years, Counseling and Consultation Service has increased its staff by one-third. Despite these increases, a review by The Lantern found CCS fails to meet the minimum international standard for recommended professional staff members providing campus mental health services. The International Association of Counseling Services Inc., an accreditation association for higher education counseling services, recommends campus mental health centers maintain a ratio of one professional full-time staff member to every 1,000 to 1,500 students for overall campus well-being. This excludes interns and trainees, as well as psychiatrists, who primarily fill prescriptions rather than perform counseling, according to IACS. Ohio State has 36 full-time staff members who fall in line with IACS standards, meaning its staff-to-student ratio is one mental health professional for every 1,662 students. The university had 59,837 students enrolled at the Columbus campus in Autumn Semester of 2017. By IACS standards, the university should have between 40 and 60 full-time senior staff members. Darryl Brush, outpatient medical director at Harding Hospital, said the staff deficiencies at CCS is ultimately hurting students who are unable to access the care they need. CCS is fully accredited by the IACS, and staffing levels are comparable with most other large, public universities, said Dave Isaacs, a spokesman for the Office of Student Life. Although Ohio State currently falls short of this ratio, IACS guidelines state, “Most centers approach this ratio to some degree but many accredited centers do not.” IACS considers a number of variables with these accredited centers, including how closely a site is to meeting a ratio, budgetary constraints and the existence of other campus mental health agencies. As of Tuesday, CCS has 40 full-time professional staffers, according to Shonali Raney, associate director of clinical services at CCS. Four of those staffers, however, are psychiatrists and therefore don’t count toward IACS standards. CCS employed 28 full-time professional staffers during the 2015-16 academic year to serve Ohio State’s campus’ student population of 58,663. The university’s ratio that year was one mental health professional for every 2,095 students, more than twice the recommended IACS ratio. Three clinicians were recently hired and three positions are currently open, making a total of 43 full-time positions, Raney said. Ohio State’s job posting website confirmed the openings, all for clinical therapists. Appointments at CCS more than doubled across a 10-year period. In the 2016-17 academic year alone, there were more than 35,000 appointments scheduled, compared to a little more than 15,000 in 2006-07. To meet an increase in demand for mental health services, the university has added 15 additional CCS staff members in the past two years, as well as expanded the counseling locations to include Lincoln Tower and the North Residential District, Isaacs said. Additionally, Ohio State has been working to improve its mental health services for years. 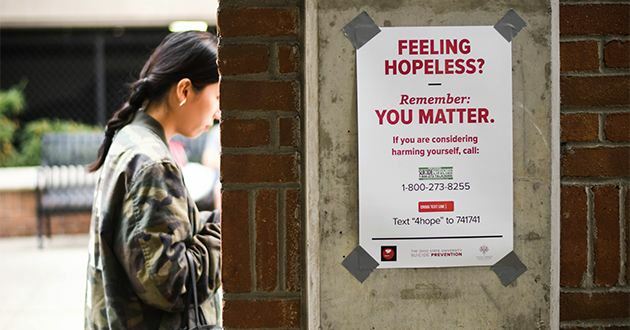 Concerns over the quality of campus mental health resources, both at Ohio State and nationally, have been at the forefront of many students’ minds in recent years as the percentage of young people across the country seeking help for mental illness rapidly increases. Julia Parker, outgoing president with Peers Reaching Out, a student-run group that runs suicide prevention trainings, said she thinks the increased attention on mental health needs of students has posed a challenge for the university to keep up. She said it’s great to see more inclusivity and conversation around these issues, but coming up with solutions takes time. There are a number of different resources on campus that students can access for mental health care, including CCS, Harding Hospital, the John W. Wilce Student Health Center and the Department of Psychology. Brush said these different entities are essentially operating separately from one another. He said the lack of communication between mental health providers on campus is frustrating for a number of reasons. For one, each department uses a different electronic medical record, so staff at different locations can’t reference lab results or counseling notes for an individual student who is referred. Parker agrees that communication is an issue, namely that students don’t know all of the resources available to them. “They really only see [CCS] as a one-on-one counseling kind of center, whereas they have a lot of other stuff they offer that can be beneficial whether or not you’re suffering from a mental illness but just for your personal well-being,” she said. Parker said group therapy sessions offered by CCS might be a better option for some students instead of individual counseling, but many students aren’t aware of this option. Brush said another issue is staffing –– both the number of staff members and how they’re hired. The counseling service currently includes one-on-one appointments for those in crisis with emergency needs, as well as daily drop-in workshops and weekly group counseling sessions, Isaacs said. “This is not intended to take the place of a person’s primary mental health care; it is intended to supplement or enhance what they may already be getting,” Isaacs said. Brush said Drake’s mental health task force can –– and should –– be the thing that connects these different entities together. With Eileen Ryan, interim chair of the Department of Psychiatry and Behavioral Health, working with Javaune Adams-Gaston, senior vice president for Student Life, Brush said he believes there is room for improvement and the opportunity to help more students. Lantern reporters Olivia Balcerzak and Ian Doherty contributed to this article.